To many climbers, mountaineers, and general fans of low oxygen environments, summiting Mount Everest represent the literal peak of physical achievement. But while an impressive feat for a human, it turns out vultures can happily survive exposed to altitudes of 40,000 ft or 12,200 meters above sea level and, indeed, have been seen flying around at this height. (For reference, this is about 11,000 ft or 3,350 meters above the peak of Everest.) Meanwhile tardigrades laugh in the face of the conditions on Everest, able to survive even nakedly exposed to outer space for quite some time with no ill effects. (Although, note: humans can actually survive exposed to the near vacuum of space for about 90 seconds without long term damage, but we have nothing on the tardigrade for durability in just about any environment.) And let’s not even talk about microbes… In the end, there are creatures that can outdo even the best of humans at pretty much any physically intensive task we feel like setting our minds to, no matter how hard we train and how good our genetics. But you know what no other known living thing can do? Use their minds to create machinery to do an otherwise extremely arduous and dangerous task in about a half an hour, all while kicking back in a very comfy chair. And that’s exactly what French fighter pilot Didier Delsalle did when he conquered Everest in a product of human ingenuity- the Eurocopter Ecureuil AS350 B3 helicopter. Humans 1, Animal Kingdom 0. Like Boulet before him, Delsalle broached the subject of landing a helicopter on Everest with the company he flew helicopters for (in this case Eurocopter) and was similarly stonewalled by killjoy executives who didn’t want to deal with the negative PR if he crashed. 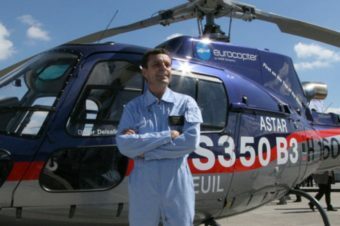 Delsalle didn’t let the subject drop and repeatedly badgered higher ups within the company, using the better-than-expected results from the test of a new engine in 2004 to convince Eurocopter that landing their Ecureuil AS350 B3 helicopter on Everest was entirely possible. The company executives finally relented and gave Delsalle some time (and a helicopter) to test his hypothesis. After all, while a failed attempt would create a lot of negative press, a successful one would be a fantastic marketing move, with their helicopter doing something no other had ever done. The idea was to prove to our customers all the margins they have while they’re using the helicopter in the normal certified envelope, compared to what the helicopter is capable of during the flight test. Delsalle then took the helicopter and flew it to 29,500 feet, about 6,500 feet above the helicopter’s listed maximum operating altitude and around 500 feet higher than the peak of Everest. After a number of additional tests proved that the helicopter would in theory have no trouble landing on Everest’s peak, Delsalle and his trusty helicopter headed to Nepal. Once there, while conducting recon on the mountain, Delsalle cemented his reputation as an all round awesome guy by taking the time to rescue two stranded Japanese climbers. When he wasn’t saving lives, he could be found jogging around the hanger in an attempt to drop every gram possible from his body weight. Likewise, he lightened the helicopter slightly be removing the passenger seats- the point of all this was to be able to extend flight time slightly. However, as part of the purpose of this publicity stunt was to show off what the Ecureuil AS350 B3 could do, other than this marginal lightening of its load, no other modifications were made. And so it was that on the morning of May 14, 2005, Delsalle slipped on two pairs of thermal underwear under his flight suit and took off. As for his choice of under attire, this was needed as he flew the entire distance with his window open… He did this rather than keep things more climate controlled as he was concerned his windows would have iced up in the -31 F (-35 C) temperatures had he not kept the temperatures equalized on both sides of the glass. On one side of the mountain, on the updraft side, I wasn’t able to approach the mountain because even taking out all of the power of the aircraft, I was still climbing. But of course on the other side you had the downdraft side, and on this side even with maybe 60 knots on the airspeed indicator I was going backward . . . and the helicopter at full power was not powerful enough to counteract that. “Landing”, or more aptly touching down, also wasn’t an easy task. When you reach the summit you reach the updraft point, and of course the updraft winds have enough force to throw you away as soon as you put the collective down. I had to stick my skids on the summit and push into the mountain to stay on the summit. Another big problem there is that you have no visual of the summit, and you have no specific cues, because you are on the highest point. You are in free air in fact, and you have to try to find where is the summit exactly. Amusingly, nobody climbing the mountain that day had any idea that Delsalle was planning on doing this and reports later flooded in to Nepalese authorities about a random helicopter seen flying around the summit. But here’s the best part- when Delsalle landed and went to check the recordings documenting his amazing accomplishment, the computer showed zero files where the recordings should have been. Yes, he had no hard evidence he had actually done this, invalidating his record attempt. If at this point you’re now doubting his May 14th story actually happened, we should probably mention that they were later able to recover the first day’s logs and video, proving he had done what he said. Of course, doubters will persist no matter if you slap them in the face with video evidence, data logs, several Everest climber accounts of spotting the helicopter flying around the summit, his helicopter skid marks that for a time existed in the snow at that hallowed peak, etc. But as for the Federation Aeronautique Internationale and a few other such official bodies, as his evidence of the two touch downs on the summit was incontrovertible, they officially ratified his remarkable achievement, much to the chagrin of many an Everest climber, who almost universally lamented the accomplishment owing to the supposed ease at which summiting the mountain was achieved. One might even posit that summiting Everest in the more traditional way is orders of magnitude easier than the way Delsalle did it, when looking at the big picture. Why Climb Everest When a Helicopter Can Land There?